Anna’s take: Field Brewing opened in October 2018. The modern restaurant and the brewery’s take on a healthy, clean menu leaves people’s taste buds and bodies happy. I started with the grilled chicken wings ($8 for a half order, $16 for a full order). The bone-in wings are braised for 1 1/2 hours, then grillled to create a slightly charred exterior. The wings are braised in a spicy garlic sauce, then tossed with fresh herbs to create a vibrant finishing touch. The wings are gluten-free and served with a house-made parmesan ranch. For my main dish, I enjoyed the Hot Grain Bowl, which exudes comfort and earthiness with faro, barley, wild rice, lentils and chickpeas. The dish is vegetarian but has plenty of protein from the grains. Kuri squash is mixed with the grains as well as walnuts, kale, cabbage, pistachios and a Chermoula dressing – an African-style spice. It’s topped with a poached egg. Suggested pairings: For the wings, order a pint of Our Lightest Beer, a German-style pilsner that cuts through the heat. 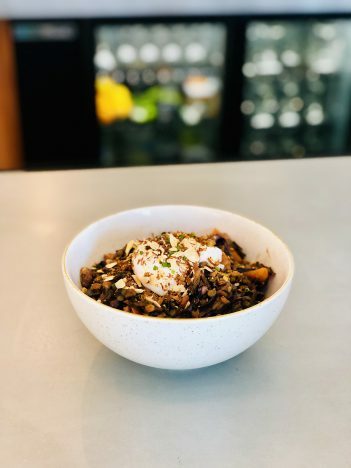 For the Hot Grain Bowl, pair it with a pint of the Centerfield pale ale, a collaboration between Field Brewing and Centerpoint Brewing in Indianapolis. All pints are $6.